As the bright desert sky turns a soft tone and dances in a range of burnt red colours I can hardly contain myself. 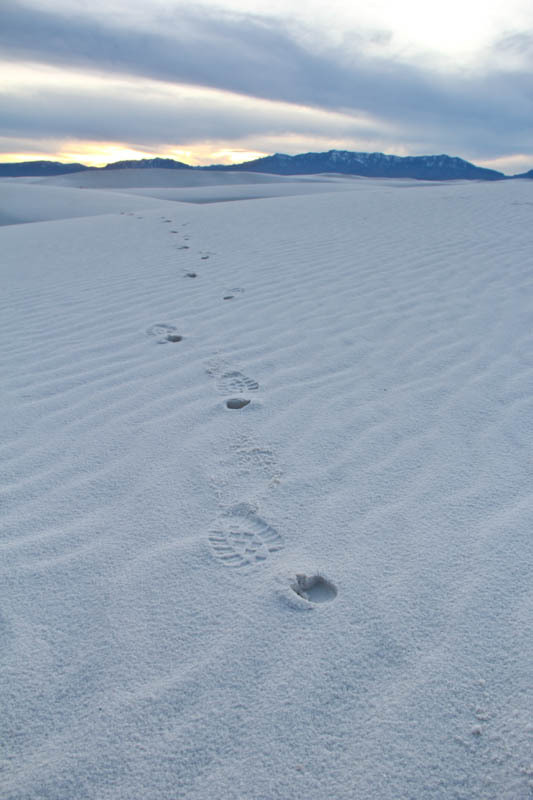 I race through the amazing White Sands National Monument in Western New Mexico hoping to capture the sky, the contrast and most of all the pristine dunes that feature this barren land. My feet scamper up and down dune after dune in hopes of finding the most expressive photo. The mood here is easy to feel – it chases up and down your spine like a first kiss- but it is difficult to capture on film. I must have looked like a maniac trying to escape jail as I fled through the landscape with my tripod and camera balanced on my shoulder. As the stars began to take over the daylight I take a shallow breath of arid air and feel at peace with the world for a moment. However, that sensation is short lived as I realize that I have forgotten my flashlight and have no idea where I am. My head turns to look in the direction I believe I have left my car and waste no time as I turn and race that way. I am stuck in a maze of dunes which twist, turn and quite often form steep unannounced cliffs. The light fades quickly as I try my best to keep my eyes fixed on a point on the horizon while also watching where I step. The light drops sharply and so does the temperature. The night before it got as cold as -5 degrees. I am wearing nothing but blue jeans, a t-shirt and a light fleece jacket. I’m not prepared to be stuck out here all night. The wind begins to howl blowing a white dust in my already squinting eyes which I shield hopelessly with my one free arm. I still don’t see a road, but I know it has to be this way. How did I get so far in to these dunes so quickly? I try my best to remember what the dunes looked like when I entered them but nothing looks familiar, a bad sign in a place where everything is meant to look alike. Ahead, I finally see a depression: the road. I slide down a steep incline on my backside while my camera’s tripod makes trails behind me. I pop up on the road in the faintest of lights. I found the road, a start, but do I go right or left? My heart tells me to turn left so I do. I hike for 10 minutes without a sign of my car. The road seems to be looping so I turn around. The light is now gone, it is essentially pitch black. I hold my camera up to my eye and flicker the flash as some sort of a light, but even then I can hardly see a thing. Finally, just as I’d about panicked, I enter a flat area: a potential parking lot. I set my tripod up and take a picture hoping the camera will be able to see something my eyes can’t. In the background a faint resemblance of my rental car. I fumble for my keys and press the remote lock over and over. I have never been more relieved to hear a honking horn and the dance of headlights. I continue to hit the horn and follow the sound and light until the star’s reflection shows me her handle. It could have ended much worse, but tonight I drove out of White Sands, New Mexico alive and as happy as ever. Gorgeous photos – I like the one with the cracked sand. 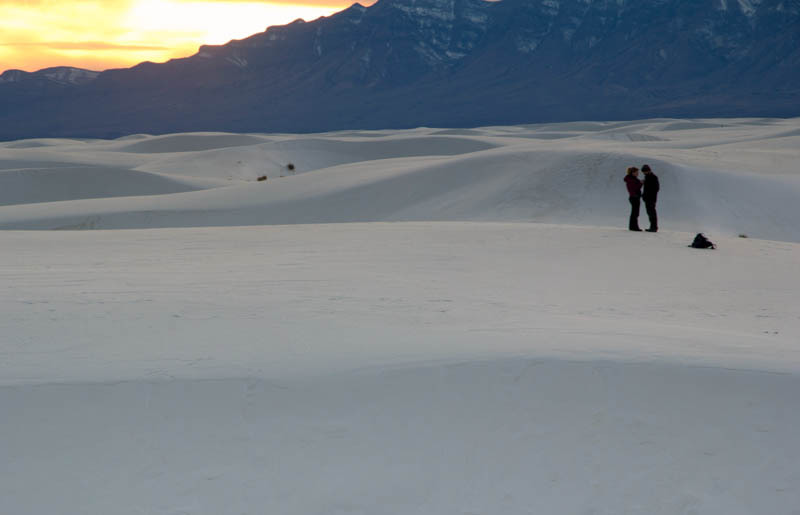 We visited White Sands last year and absolutely loved it – the sunsets are incredible! 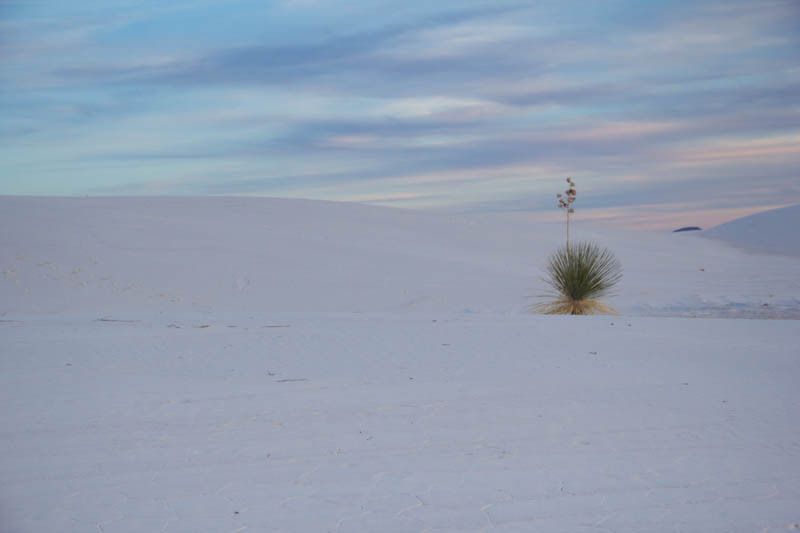 Thanks Christy, I think think White Sands will go down in history as one of the most random geological destinations I visit. haha. There is something about that place, a missile range, and nearby roswell all together that makes it a really strange area. 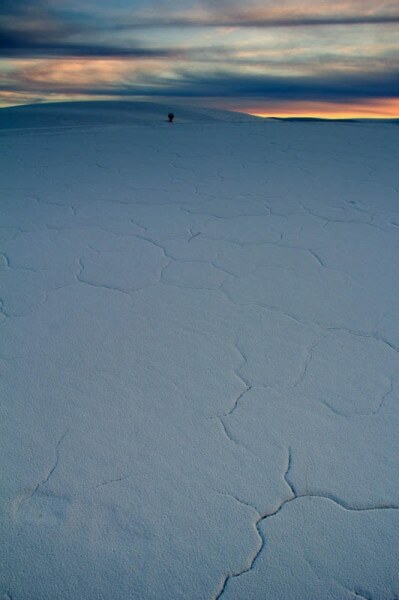 What a great location, there’s something mystical about such pure white dunes. Nice photos, and poetically written. Seems like a pretty special place. Thanks Nate, White Sands is strange if not mystical haha. Great place though. @Trans-Am – It was really only scary once it turned pitch black. I was really just laughing the entire time. The I realized how much being out there with a camera reminded me of that movie 127 hours haha. Been there done that. Not in the White Sands Monument, but I know that feeling of not being exactly sure of where your car is as the sun fades. Such a relief when it comes into view. @Ted – One of these days I’ll smarten up and prepare myself on these dusk photo shoots in the middle of nowhere… but to be honest, getting lost made for an article. If I hadn’t it would have been a fairly boring story haha. After reading your article this morning, I still managed to make it back to the car park as it turned dark….scary stuff. Yeah, it’s deceiving! I hope you got some cool photos of White Sands, though!